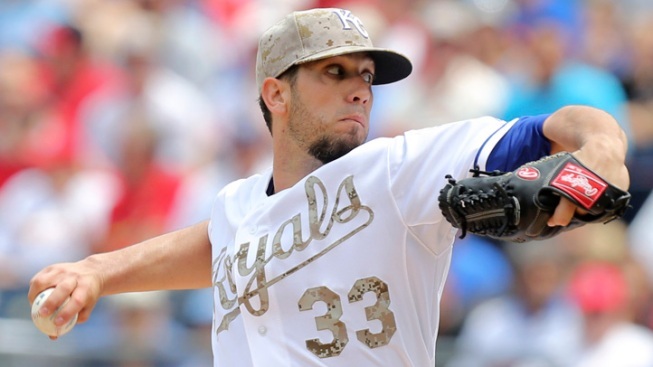 Jon Daniels called it nothing more than due dilligence, which is probably was, but the Texas Rangers did meet with the agent for free agent starting pitcher James Shields on Wednesday in San Diego. It is a bit interesting that there was no real mention of him all week in the Winter Meetings outside of the reports on Wednesday that the Rangers had met with his representatives. The big pitching domino to fall was Jon Lester, and once he signed the idea was that guys like Max Scherzer and Shields would follow suit, but that hasn't happened yet. Shields would be cheaper than both Lester and Scherzer, and probably could be had at a much smaller term than those two, as well, which would make him a possibility for the Rangers, who are looking for another starting pitcher and made it clear from the beginning they wouldn't be in on guys like Lester and Scherzer, though they never came out and ruled out Shields. Shields is quite the beast in terms of endurance, having eclipsed the 200-inning mark in each of the past eight seasons. In 2011, he had 249 1/3 innings and led the league in both complete games (11) and shutouts (four). At 33, he could possibly be had for a three- or four-year deal.